The legendary Free Tommy Chong activist, Bobby Capps, recently sent a letter to the Kerry campaign requesting Ashcroft be investigated. In addition, he stated that Tommy Chong should receive a presidential pardon. Today Cheech Marin and a host of other celebrities attended John O'Hurley's wedding. O'Hurley played Elaine's boss on Seinfeld. A federal appeals court tossed out a ruling made last year by US District Judge Charles Schwab. In this case, Schwab (the same judge that sentenced Tommy on bogus charges) copied someone elses opinion word-for-word. The appeals court ruled that he put no thought into his decision. Also, make note that this judge was appointed by President Bush and only had nine months of experience when he sentenced Tommy. New C & C shirts just arrived. These things are great. Also take note that we are offering $5.00 off the Rock N Roll Headknockers. While supplies last. Once they sell out, they're gone for good. Cheech Marin and other celebrities will pay tribute to Carlos Santana at the 5th annual Latin Grammy Awards. It will be broadcast live on the CBS Television Network (8 - 10 p.m. ET/PT) from the Shrine Auditorium on Sept 1. Our F*CK THE FCC t-shirt can be seen in the October issue of Hustler magazine (available at newsstands today). Look for the naked girl wearing nothing, but a t-shirt. It's a very political issue and discusses, among other things, Howard Stern. Stonerdude, the brilliant designer of these shirts, is also mentioned. Visit his web site here. Chicano, an unprecedented dual art exhibition, presented by Target Stores, sponsored by Hewlett-Packard Company and produced by Clear Channel Exhibitions, will open to the public at the Weisman Art Museum in Minneapolis and the Minnesota Museum of American Art in St. Paul on October 2, 2004. Chicano is a five-year, 15-city national tour that is collectively made up of two major exhibits: Chicano Visions: American Painters on the Verge, a traditional art exhibit, and Chicano Now: American Expressions, an interactive multimedia exhibit for families. The interview GQ magazine conducted with Tommy Chong while in prison hits newsstands July 27th. On July 13th, Cheech Marin is turning 58 years old. Happy Birthday, Cheech! It's streamed online. Free 5 day membership. Update: Once again, Allan conducted a very thorough interview. Here are the highlights. When the agents raided Chong's house, they weren't looking for drugs, they were looking for bongs and weapons. Tommy explained that if you are busted for bongs and also have a weapon in your house, it increases the length of your sentence (even if you have a permit). Agents appeared to be embarassed that they had to conduct this raid. Agents confiscated the bongs, but left the opium pipes because Operation Pipedream only wanted marijuana-related items. 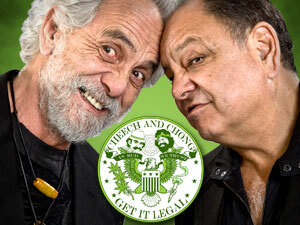 Tommy expects the new Cheech and Chong movie to enter production this September. This evening, Tommy Chong made his first television appearance since being released from prison. The interview was great. Tommy looked good. Jay recapped what happened to Tommy. There were plenty of jokes about prison life. As revealed earlier by Cheech and Chong Dot Com, Cheech Marin made a surprise visit. Tommy and Cheech once again confirmed that they are working on a new movie. Jay really should have bumped the World Cup guests. The entire show have been dedicated to C & C.
This Sunday, Tommy Chong returns to the Allan Handelman Show. See the official Allan Handelman Show website to learn how to hear it live. Earlier today, Tommy Chong was finally released from California's Taft Correctional. Tommy had been serving a nine month sentence because Chong Glass shipped bongs to Pennsylvania via US Mail. Ironically, Tommy did not own, nor operate Chong Glass. 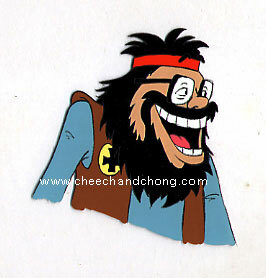 The business merely used Chong's likeness. It was all part of the Bush/Ashcroft "religious right" crusade. Tommy was punished for his movies, not for anything he did. Dozens of other headshops were busted during the same Operation Pipedreams crusade. However, Tommy was the only one who served time. The Feds told Tommy Chong that if he didn't take the rap for Chong Glass, his wife and son would. They also promised Tommy that they would be lenient on him. THEY LIED! Today, Cheech Marin paid a visit to The Wayne Brady Show to promote his travelling art exhibit, Chicano Visions. He reiterated the fact that he and Tommy are going to work on their reunion movie when Tommy his released. He joked saying the movie will be called "The Passion of Cheech and Chong." One week from today, on May 24th, Tommy Chong is turning 66 years old. Unfortunately, "the man" is making "Man" spend his birthday behind bars. Well, screw the man and his trumped up charges. 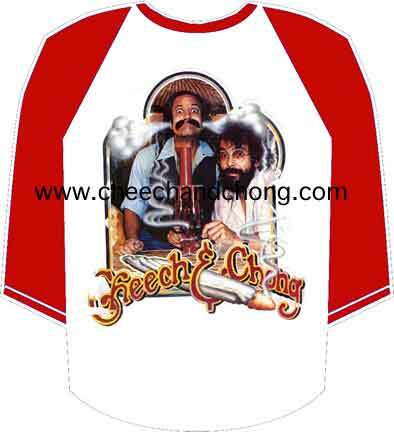 From now until May 24th at 11:59 PM New York, our Free Tommy Chong T-Shirts are buy one, get one. In other words, if you buy 1-XL, you get 2-XL in your package. Update: T-Shirt offer extended until further notice. Production has just begun on Cheech Marin's new film, Christmas With The Kranks. The Grisham adaptation was forced to change it's name from Skipping Christmas because it was too easily confused with Dreamworks Surviving Christmas which will be released at the same time. Recently, while driving thru Los Angeles (Avenue 35 and Fig), a group of C & C fans stumbled upon Strawberry's house. The building that Cheech crashed into with his sidecar is also still there. Very cool! Ray and Laurie (photo #3) sent us the photos. The gentleman in photo #1 is from California Magic. On the air today, Howard Stern read a letter that Tommy Chong wrote him from prison. In the letter, he says that the working title of their new movie is Dis-Jointed. The film will be directed by directing newcomer, Larry Charles. Larry Charles has written for Curb Your Enthusiasm and Seinfeld. Tommy also said that while he's in prison, he's written enough material for numerous books and movies. Stern was going to post the letter on his web site. It's still not there. You can, however, read about it on Mark's Friggin. When:04.20.20049 - 11 PM PST. Due to the festivals rising popularity and growth, they have moved the festival from Slingapours indoor club to Calico Jacks. They will be closing off an entire shopping mall parking lot in order to make a more adequate festival grounds for the event. The sponsors Orlando's Real Rock station 101.1 FM (a clear channel station) will be presenting the event along with Miami Blunts. In addition, the Orlando weekly who is doing a full feature story and Hightimes magazine is doing promotion for the event on their web site(Thanks Steve Bloom!!). Other sponsors will be confirming this week. When & Where?NEW DATE: April 30th 2004NEW LOCATION: Calico Jacks, 1259 State Road 436, Casselberry FL. Why?As you have probably heard by now, on September 11, 2003 cultural icon Tommy Chong was sentenced to nine months in federal prison for his role in selling glass water pipes on the Internet through his legally licensed company Tommy Chong Glass. Tommy Chong is the first person to be prosecuted under John Ashcroft's "Operation Pipe Dreams" and "Operation Headhunter," which shut down national glass distributors nationwide, resulting in the indictment of over 55 people.Tommy Chong was obviously targeted by the federal government because of his status as a cult figure among marijuana smokers. The federal raids on paraphernalia distributors has been an utter waste of time and money, while it has ruined the lives and careers of otherwise law abiding citizens. These businesses pay taxes and do not in any way contribute to the crime problem in America. To target them at this time shows a total lack of understanding as to which risks truly threaten the health, welfare and safety of America's citizens. On April 30th , 2004 there will be a concert to raise signatures and awareness on behalf of Tommy Chong, We believe that he was unfairly imprisoned and needs your help . So, come out to Calico Jacks and help support Tommy Chong while having a booty shakin', rockin' time! Festival Lineup:BLOWFLY "Thee Original Dirty Rapper"
Decent turnout this rainy afternoon. The media was on-hand. The Sacramento NBC affiliate is running a report on today's protest (watch this evening's NBC news). Photos above are of Bobby Capps (dressed as Pedro), Stoner Dude of Knumbskull Records' band, BONG, and others. Another person is currently organizing a protest in Fresno. We'll give you the details as they emerge. A major Free Tommy Chong rally is taking place this month in California. If you care about Tommy Chong and your rights as an American, you must attend. Location: North steps of the state capital in Sacramento, CA. Purpose: To get Governor Schwarzenegger to call George W. Bush to free Tommy Chong. Costumes and signs are requested. NO BUSH BASHING SIGNS, PLEASE. This protest is being organized by the infamous Bobby Capps. He's the person responsible for hanging Free Tommy signs from overpasses, as well as writing it in the burnt brush along Route 80. Email Bobby with any questions you may have. Cheech Marin makes his debut on Judging Amy Tuesday at 10PM EST on CBS. He plays a potential love interest of Amy's mom, played by Tyne Daly (YIKES!). Cheech Marin's 15-city traveling art exhibit, Chicano Visions, is coming the Indiana State Museum later this month.